We’re lucky enough to have Lauren Wood, a budding food blogger and avid traveler, write for us this week. This entry has been long in the making–two years ago, she was traveling in Korea, and happened to meet our executive producer, Charlie Pinsky. Upon striking up a conversation, he invited her to write a guest blog entry… here it is! Lauren talks about her time eating in Seoul, from street food made fresh, to a 20-course temple meal. Many dream of traveling the world, and I am one of those lucky people who gets to do just that. I was born in Scotland and have lived in Canada most of my 17 years, and as a result, I’ve seen quite a few Canadian Provinces and European countries. In May of 2010, I was lucky enough to accompany my mom on a two week trip to the Republic of Korea, which is truly a country of marvels. A few months before that trip I had been contemplating my career options and I knew I could only be happy if I pursued my passion: great food. I had started a blog about my quest to become a chef. The opportunity to travel to Korea and discover an ancient cuisine little known in the West was the first in a series of fortunate events. Serendipity, some would say. In fact, meeting the team filming Kimchi Chronicles was completely random, but also felt as if it was meant to be. 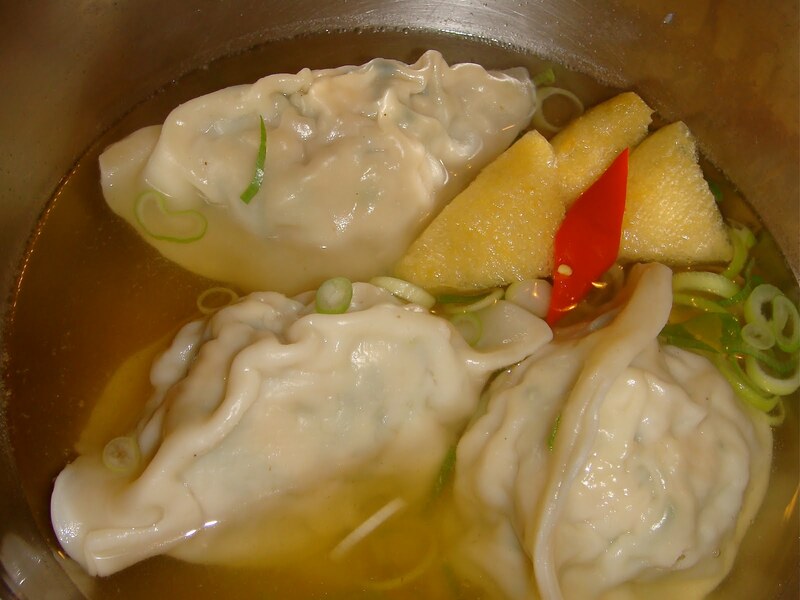 When it came to Korean history, culture and cuisine, I was an eager neophyte. Before leaving for our trip, my Mom and I had to do some in-depth research; our European travel staple – the Rick Steves series of travel guides – didn’t have a Korea version, nor is Korea such a popular destination that guidebooks are abound. We got some good tips from Frommer’s Korea about places to eat and things to see, enough to fuel our sense of adventure and our appetites! I decided on total food immersion, so with my Lonely Planet phrasebook in hand, I jumped right in and ordered bibimbap on our Korean Air flight from Toronto to Seoul. Airplane food rarely sets the culinary bar but the explosion of new flavors was heaven to my taste buds; I knew I was going to have a great time eating my way through Korea. 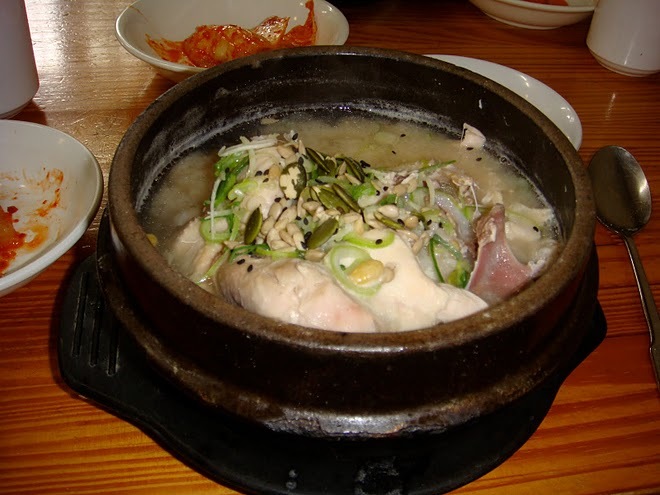 Our first stop in Seoul was lunch at Tosokchon, a restaurant famous for it’s chicken soup, called samgyetang. Served in a stone bowl, a whole spring chicken sits in savory broth. The chicken is stuffed with rice, ginseng, chestnuts, dates and sprinkled with spring onions, pumpkin, sesame and sunflower seeds, and the meal is accompanied by a glass of ginseng wine (which my Mom said was delicious) and an array of kimchi. With its reputation, the line to get into the restaurant continued far down the street, but the wait wasn’t too long. We were the only Westerners there and we were brought through a series of courtyards to an elevated room with communal tables where we left our shoes at the door and sat on a small cushion on the floor. Accompaniments are served family style; the other patrons at the table took great pleasure in welcoming us and showing us how to put together our meal. Language is never a barrier when good food and smiles are abundant. One of the highlights of our trip was our experience at Sanchon, a restaurant known for its temple cuisine, essentially food that the monks eat. Upon the arrival of the first course, you think, ‘wow, this meal has 20 courses… they must be light and easy to digest.’ On the contrary, the porridge in the first course simply whets the appetite for the second course of rice, soup, and tons of vegetables, which are not your average peas and carrots, but rather, all manner of shoots and roots such as burdock and dandelion and others that I cannot name. Most were novel, many were delicious and others just tasted strange. Accompanying all of this were sauces and condiments like watery kimchi and other exotic flavors. Everything was well balanced in terms of taste–salty, spicy, bitter and even sweet. For dessert, we indulged in more street food after walking off the heavy dinner, this time in the form of Dragon’s Beard candy made with honey and nuts. **Stay tuned for Part II, where Lauren takes on Busan! 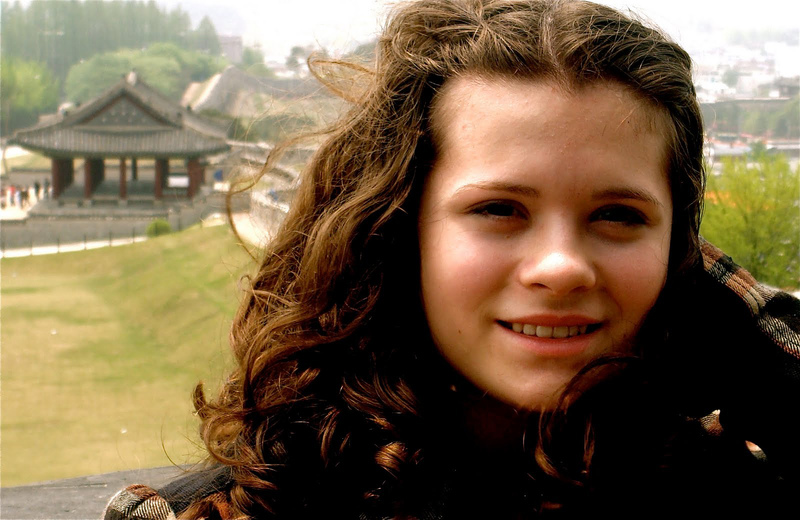 Lauren Wood is a budding food blogger who has always had a love affair with food. From her first olive at the age of 9 months, to kindergarten lunches of leftover stuffed squid, her food education began at an early age. She credits her family of great home cooks and food lovers as a major influence. Travel is one of her major hobbies, and she loves tasting local cuisines and experiencing rich and distinct culture through food. Her other passion is writing, and her blog is a chronicle of her food discoveries, in search of the best education, ingredients, experiences, and mentors. She hopes to one day become a chef.